Pre-packaging, over-processing, inferior ingredients propped up with tastebud-numbing flavourings and preservatives…we pay extra for them all, even though we increasingly can’t afford it. We forget that good food often costs less. The first thing that needs to be rediscovered is stock. It’s the bedrock foundations of a superb dish. It’s the double bass in a symphony of taste. It’s easy. And it’s often made from what we throw away – not the 27% of edible groceries that end in the trash, but the inedibles. It’s recycling alchemy. So here’s how to make food from nothing. Rubbery vegetables. You’ve left them too long in the fridge or cupboard, and now they’re past their optimal freshness. But they’re still packed with vitamins, minerals and taste – so chop them into a pan, add water and boil. Peelings. Why do we peel and trim vegetables and fruit? Sometimes because there’s too much flavour, other times because they’re too tough to eat. Perfect for stock on both accounts. Bones. The last time I received a clip round the ear was when I threw the picked-clean remains of the Christmas chicken away. Now I know better (thanks, Ma). If you’ve ever tasted the real deal, going back to stock cubes is a depressing experience. 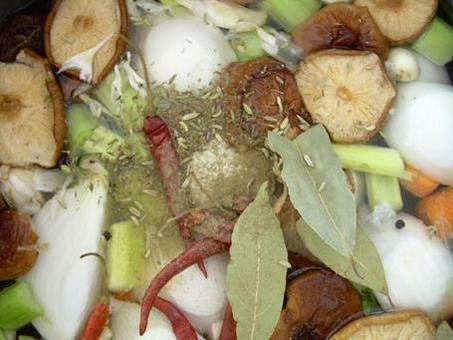 Fresh chicken stock is a few herbs and spices away from being the best chicken broth for when you’re feeling glum or ill. Preserving. Drain away as much fat as you can, and freeze the remainder. Freshly-cooked stock always tastes slightly better, but frozen stock is still a huge step up from cubes, and it keeps for up to 6 months. Eating. Soups. Tagines. Stews. Roasts. Did I mention soups? Baste, soak, drizzle, simmer. Count your cash. And enjoy!